Choose your route here then the available times for that route will be shown. You can then choose the time and click through to booking. If you want Koh Kham or Koh Rayang, then please use Koh Mak as your origin or destination. Click on the link for the service you want to book. Child age/price policies for that service will then be shown. 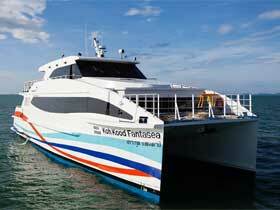 You are making a reservation for the 09:00 Boonsiri Catamaran from Koh Kood to Trat. Trip information: This is a Catamaran Ao Salad to Laem Sok. Wrong route or time? Click here to change. In the form below, please enter your date of travel, your name, the number of passengers and your email address. If you know them, please also enter the names of your hotels in Koh Kood and Trat. After you click on submit, your booking request will be sent to us and you should also receive a copy of this. Following our validation of your request, and if there is availability, we will reply to you with our Paypal invoice, or with a request for further information if your request was unclear or incomplete. Anything not covered by this booking form or if you have any queries or more specific requirements, then please contact us using the general contact form here. If you want to choose a different route or time, then go back to the route table by clicking here. Copyright © Trat Ferries / Coco Dee Bo. Template designed by JoomlArt.com. tratferries.com is a marketing website of Coco Dee Bo Tours, Koh Chang, Thailand.